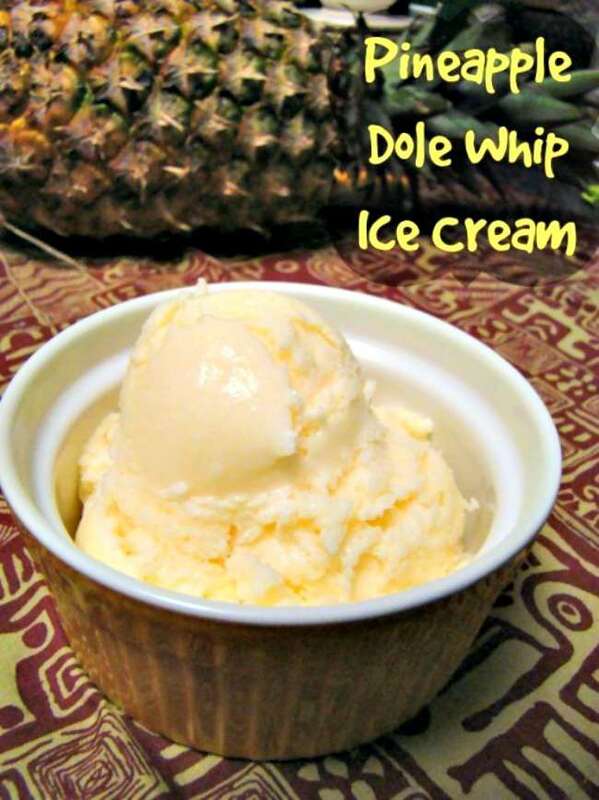 Now you can have create this Dole Whip recipe at home!!! For many Disney World Travelers, a Pineapple Dole Whip is a park snack you can’t do without. Now you can make this super simple dole whip recipe at home and enjoy it without having to go into the park. I’ll admit that I get a Dole Whip or a Dole Whip Float every time we go to Disney World in Florida or Disneyland in California. It just isn’t a good trip without having at least one. If you have never had one, I’m so sorry. But then again, you don’t know what you are missing. What is a Pineapple Dole Whip? According to Wikipedia, a Dole Whip, also known as Dole Soft Serve, is a soft serve pineapple-flavored frozen dessert created by Dole Food Company. Our family just knows it as “Deliciousness in a Cup!” It is served as soft serve in a cup or as a float with Dole pineapple juice. I almost always get it as a float. The picture below is the Soft Serve in a cup. When you can’t go to a Disney Park to enjoy a Dole Whip, having a simple recipe is the next best thing. Eat it as soft serve straight out of the ice cream maker. This is just like what you get in the park. Plus, this is the quickest way to get your coveted Dole Whip. Serve the ice cream style after the ice cream has been frozen in the freezer. Basically you’ve had that initial serving and decided to freeze the rest for later. Serve as a float served with chilled pineapple juice. You can use soft serve or ice cream with the float. Serve your Dole Whip adult style with a little something something. During a past Flower and Garden Festival, Disney started offering a special Dole Whip served with a shot of Spiced Rum. Add a shot of spiced rum to your Dole Whip for a n adult sized kick. I REALLY like it when I added a shot of Captain Morgan’s Spiced Rum to 1/4 cup chilled pineapple juice and added it to 2 scoops of soft serve. OH MY ……. Mix everything together and add into your ice cream maker. Follow directions for your ice cream maker. Serve immediately once frozen as a soft serve or freeze for ice cream. The original Dole Whip recipe is vegan. But at home I like the taste of milk in my ice cream, so this version is definitely not vegan. If you are looking for a dairy free version, take a look at my Dole Whip Smoothie recipe than can easily be converted to use nut milk/beverage. Have you ever had a Dole Whip? If you’ve ever found one outside a Disney Park, let so know and enjoy one the next time we are in the area. Delicious! I always love homemade ice cream nice and soft, right out of the ice cream maker. We’ll enjoy this recipe. I tried the Dole Whip with rum at Epcot on our recent trip. It was a fun novelty, but I think I’d get it plain next time. Although the float is tempting too . .
Annemarie, the next time you are at Disney visit Capt. Cook’s at the Polynesian resort. They have self serve Dole Whip. But you may not need it after you try this recipe. 🙂 I love the float. It prevents me from eating the ice cream too quickly and getting a brain freeze. Enjoy! We love Captain Cook’s! We stayed at the Polynesian 2 years ago and having a good quick service restaurant was one of the many highlights. This sounds amazing! Reminds me of Hawaii and being at the Dole Plantation! Yum! Newest follower from the Sunday Social, please stop by when you can! Thanks for stopping by from the Sunday Social. This is one of my favorite Disney treats. I’ll stop by your site for a visit shortly. Hi just visiting from Let’s Get Social Sunday, this frozen treat sounds delicious, I Pinned it to try later! HI Terri! Thanks so stopping by. This is one of my favorite frozen treats. I hope you do get a chance to try it. Take care. Thank you so much. I would have felt guilty if I hadn’t shared. 🙂 I, too, am ready for spring. Take care. LOVE Dole Whips! We’ve stayed at the Polynesian 3x and it’s my favorite dessert. We also checkout out the Orange Concoction last year at Aloha Isle! So good! Love your blog! I’ve never had the Orange version. I’m going in a few weeks, I’ll have to add it to my “Must Eat” List. Thanks so much for stopping by. Hi Heather. I’ll be happy to stop and share them. This recipe was submitted for the Top Recipe Showcase at Recipes from a Pantry. Oh girl and I just bought an ice cream maker too! Oh yeah. Pinned and will make next week. This ice cream puts a smile on your face and makes everything better. 🙂 I hope you enjoy it. Thanks for sharing at Freedom Fridays blog hop!!! Thanks so much Evelyn. I really appreciate it. If you get the chance to try to it, you’ll LOVE it. Thank you for entering this recipe at the Top Recipe Showcase for March 2013. I have never ever had pineapple ice cream so on my to do list..
Bintu, thanks for hosting this event. We LOVE this ice cream. You will too! Dole Whips are a must whenever we go to Disney. This homemade version is amazing. If you like pineapple, you should try it. I’m always happy to share great food. Disney’s Pineapple Dole Whip Ice Cream is one of my favorites. When you mention this on The SITS Girls thread, I couldn’t resist. You have won my heart with this post. Thanks for sharing this recipe! I’m going to try it soon! Dole Whips are awesome! We love going to Disney and eating around EPCOT and the Magic Kingdom. I think I need to recreate a few more of our favorite recipes. I hope you enjoy this one. It’s also really topped with a 1/2 shot of spiced rum, if you’re a drinker. I’d love to hear how you like it. I have seen this on Pinterest and heard about it from friends. Oh gosh is sure sounds and looks good. I love pineapple anyway! Hi Dawn. If you love pineapple, you’ll love this ice cream. A Dole Whip at Disney is like getting a hot dog at a ballpark or peanuts at the circus. You just have to have one when you go. No fair, its January and now I want to go dig out the ice cream maker!!! Sorry Shelly. I’ve had enough cold weather and will never complain about the heat again. You could always warm up with a shot of spiced rum over the ice cream. I will be pinning this! My husband isn’t a big dessert person, but he loves dole whip. I think he would be ecstatic if I made this for him! And it would be a great reason to dig out the ice cream maker which we hardly ever use. Thanks for sharing! Visiting from the SITS group. This is one of my favorite recipes. He’ll love it! Right out of the I’ve cream maker gives you the texture of a soft serve dole whip. After its been in the freezer is resembles traditional ice cream but the flavor is the same. Let me know how he likes it. Now this looks yummy! I’ve never tried the Disney version but yours look just as good! Looks so yummy! I’m hosting a #DisneySide @Home party next month and got the recipe for the Dole Whip in my hostess box. Can’t wait to try it out! all the times I’ve been to Disney and I’ve never had it! I saw some of the kits that were shipped. What fun! I can’t wait to hear about your party. How different is the “official” recipe from the one I created? Pineapple ice cream sounds so good. I’ll eat pineapple anything. Pinned and plan on making this. Thanks Erlene. This is a delicious ice cream. It never lasts long in our house. Let me know how you like it. What a fabulous idea! I have to pin this! Love love love it! I’m going to have to give this a try. Back in the 90’s I was a little obsessed with dole whip. There was an ice cream place closeby that swirled it with vanilla ice cream in a cone! YUM. We made a yogurt shop here that made a similar one too. Unfortunately, they closed up and so I had to create this yummy recipe. You’ll love it. This one tastes more like a mix of Dole Whip and vanilla ice cream than the parks version, but still pretty descent. It’s as close to the real thing as we could get. It’s hard to beat the real thing. Yum! This looks SO good! I really like your version! After looking up the actual ingredients of the Dole Whips sold in the parks, my husband and I vowed to make our own version of this delicious Disney treat to celebrate our upcoming trip to the Magic Kingdom. We’ll have to give your version a go! I love Dole Whips!! I will definitely need to try this at home especially since I cant go to Disney ALL the time…I’d like to though! So would I! If I could convince my hubby, I’d like within driving distance to Disney too. I have never had this and now I must whip some up! Thanks for this recipe. This is one of our favorites. You’ll enjoy it. I’m sorry but this tastes NOTHING like Dole Whip. Did anybody commenting actually TRY this? The coconut sugar gives it a bizarre, unpleasant taste. I’m glad we only made half a batch because we wound up throwing it away. It was honestly that bad.